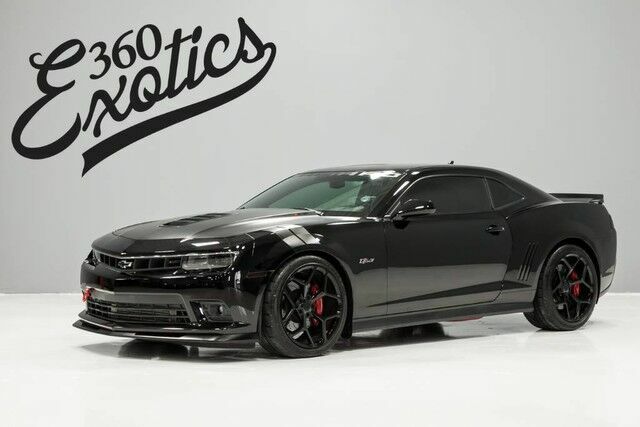 360 Exotics is proud to offer this 1 of a kind Camaro SS with the highly sought after RS pkg and even more rare 1LE performance and track package! This car is unlike anything else on the road and has been meticulously taken care of since delivery off the showroom. The cars 1 and only previous owner was an aircraft mechanic and maintained this car with the same precision as one of his private Jets. To start off this car was special ordered and was only 1 of approximately 1200 Black Camaro SS/RS-1LE cars ever made and from there the one-off/custom build began! The list of upgrades was long and thought out while also being highly scrutinized in order to achieve a final product that does a lot of things really well. The plans were to take a car that Chevy had built from the factory to be a very good track focused car and to make it better by not only being able to run crazy fast lap times at Cota but to also be able to drive the car to the local drag strip and kick some a$$ there as well. In order to do both things really well with the same car is no easy task but with some good planning, by using some of the latest technology from procharger, and with no expense spared he was able to turn and amazing car from the factory to a Dual track weapon! The best part about it all is that after a build that took 3 years to complete the previous owner only took it to the track one time before he realized that he had built a car so nice that he couldn't stand the thought of it getting torn up at the track by rocks and debris so he decided to sell it and get something a little older and not as nice that he would be ok with getting beat up at the track. Now someone will get the opportunity to own a car that was built to perfection and capable of handling whatever you want to throw at it, for a fraction of the cost to build yourself. The list of parts for this build and the receipts are so long it took a 3 ring binder to keep them in order and as a very meticulous aircraft mechanic, he kept every single document, from the original window sticker, right down to the brochure for the top of the line ceramic window film. Don't miss the opportunity to own a very rare car with the best parts money can buy for a fraction of the cost to build. This car will not last long so call 360 Exotics today to schedule your private viewing appointment. The following wheels & Tires will come with the car IF SOLD AT FULL ASKING PRICE!